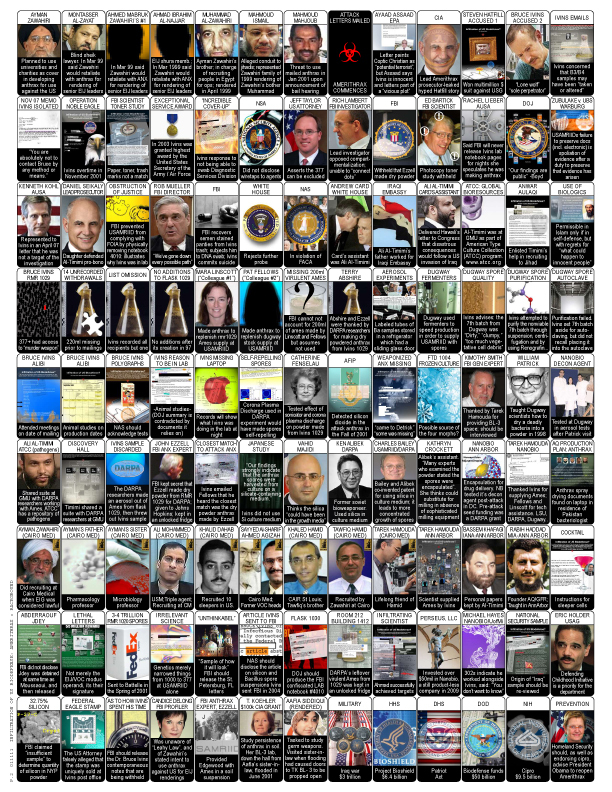 2011 February « CASE CLOSED … what really happened in the 2001 anthrax attacks? I previously had no idea that the tin concentration was 6000 ppm – I thought is probably 100ppm and interesting but not a major finding. This is because the FBI withheld the information. Even from Sandia and Livermore. Had that information been made available to Livermore 8 years ago, as it should have been – the Livermore scientists would immediately have suspected a connection between silicon and tin. The most obvious one is that a tin catalyst was used to cure the silicone (polymerized glass). Tin is commonly used for this purpose. 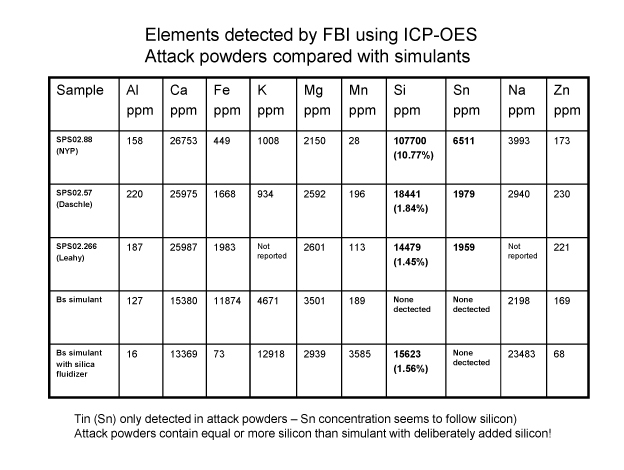 That the FBI deliberately withheld the silicon concentrations from Congress is beyond dispute, That’s what they did – no ifs ands or buts about it. that they have something to hide. These results are truly astonishing. They should have been shared with the FBI partner labs studying additives in the spores 8 years ago. Instead the partner labs were apparently kept in the dark. Scientists cannot work this way. Had these scientists known about the huge concentrations of silicon and tin, the case may have been solved years ago. Bruce Ivins might be alive today. It is unprecedented to find any detectable tin (Sn) in spore preparations. Only a specialized chemical like an organometallic tin compound could give such a signature. The tin seems to follow the silicon – the more silicon, the more tin. One obvious first hypothesis is that the silicon got there via a polymerized glass chemical – a silanol. Tin is commonly used as a co-additve in such formulations – used for microenpapsulation. Now that these results are finally released – perhaps scientists can do their jobs and solve this case. Let’s hope somebody can solve the case, because whatever else is true, it is a certainty that the FBI has not done so. To simplify the matter — so that we can get all get on the same page — consider this. AUSA Rachel Lieber and Kenneth Kohl have not disclosed to you the time of an email they rely upon that Bruce Ivins wrote to Mara Linscott on September 17, 2001. 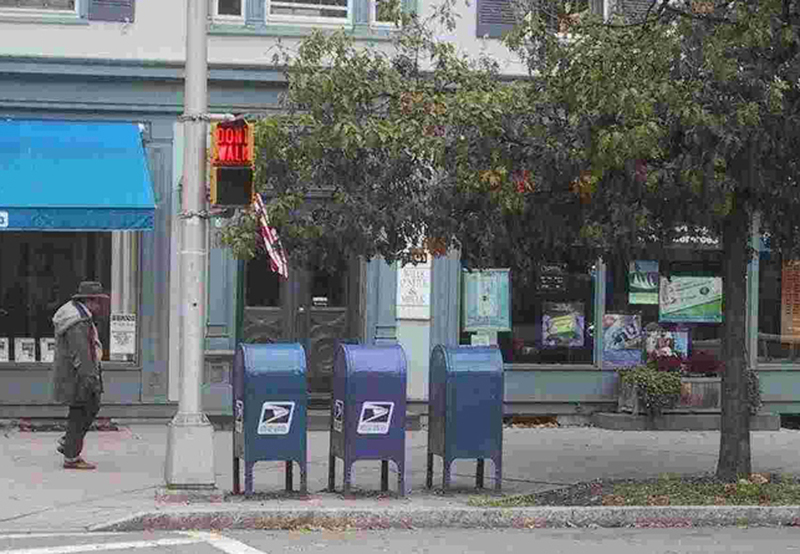 Nor have they disclosed the times and content of other emails he wrote the day they allege he traveled to Princeton to mail the letters sometime after 7 p.m. in the evening. The investigators and prosecutors would not disclose the alleged “window of mailing” to Dr. Ivins or his attorney until after his suicide. It was left open to include a several day period … until after Dr. Ivins’ death. If they had disclosed that the mailing occurred after 7 p.m., the issue of Dr. Ivins’ alibi could have been fairly considered based on the documentary evidence. The law (FOIA) requires it. 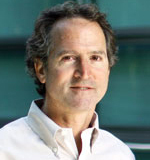 David Relman, MD, vice chair of the NAS review committee, is a professor of microbiology and immunology and of infectious diseases at the Stanford University School of Medicine. He answered the questions below from Bruce Goldman, a science writer in the medical school’s communications office. Q: Did your review uphold the FBI’s findings? Is this case still open? The main conclusion by the FBI and Department of Justice of their scientific investigation was that the Bacillus anthracis in the letters was derived from a flask called RMR-1029, which was located in the lab of Dr. Bruce Ivins at the U.S. Army Medical Research Institute for Infectious Disease in Frederick, Md. Although the scientific evidence was supportive of a link between the letters and that flask, it did not definitively demonstrate such a relationship, for at least two reasons. it’s possible that the samples gathered by the FBI missed mutants that arose during such runs. This possibility was not given adequate consideration. at an al Qaeda overseas location highlights this issue. In addition, the instructions in the subpoena the FBI sent to scientists known to be in possession of the B. anthracis Ames strain lacked specificity, so there’s no certainty that scientists who were subpoenaed submitted samples of all the mutant strains in their possession. 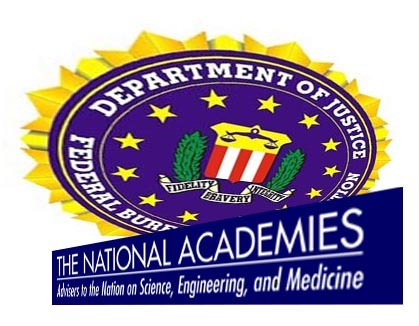 The FBI, under the best possible interpretation, botched the scientific investigation. in addition, much relevant information was not only kept from the public, but also from the scientists who were supposed to be doing the investigation. and the subpoena power to obtain the information they need. * silicon additive clearly observed in Daschle powder … The FBI tried for 8 years to duplicate this obvious silicon additive – and failed. They cannot explain it nor can they link it to Dr Ivins or USAMRIID. This image was obtained on October 19 2001 by Battelle labs of the Daschle spores. The image is independent of the images taken by AFIP. This particular image is one of four – in this one the SEM operator found a spot on the sample containing mostly elongated crystals along with some spores. 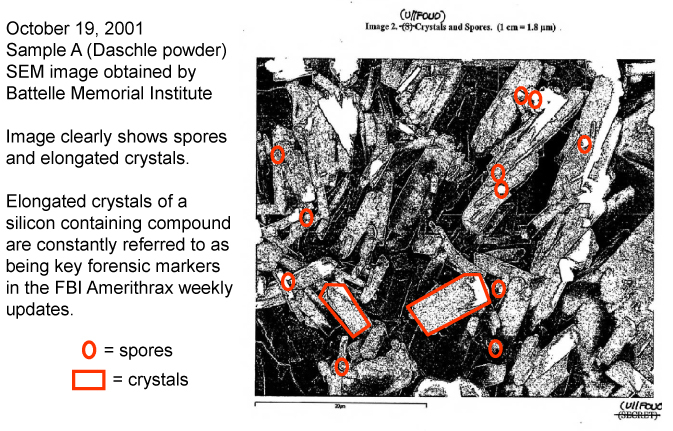 The elongated crystals are referred to in the Amerithrax weekly reports as being composed of a silicon compound. This is similar to the findings in the New York Post powder – only in that sample there was much more silicon compound present. This contradicts previous FBI statements which said there was no exogeneous silicon present in any of the samples. to duplicate this obvious silicon additive – and failed. nor can they link it to Dr Ivins or USAMRIID. DXer: The big picture may seem complicated. But, most simply, Dr. Ivins in fact had an alibi on 9/17. That was when his group therapy met. Most of the committee members have ties, direct or indirect, to the “biodefense” contracting cash flows that were instituted in response to the anthrax letters – well over $50 billion by this time, correct? Does anyone know if the NAS ever spoke publicly on these issues? NAS – if you’re reading this – you are welcome to comment here on the CASE CLOSED blog. concludes that the FBI’s case is in tatters and that America will probably never know if Ivins was guilty or not. 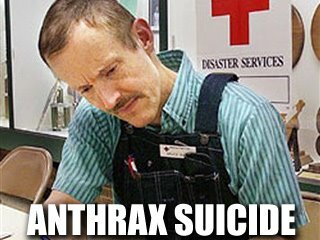 The anthrax attacks in 2001 were a devastating blow to our national security. Equally so is the FBI’s failed investigation of those attacks. Did the FBI actually fail to solve the case? Was the FBI prevented from solving the case? 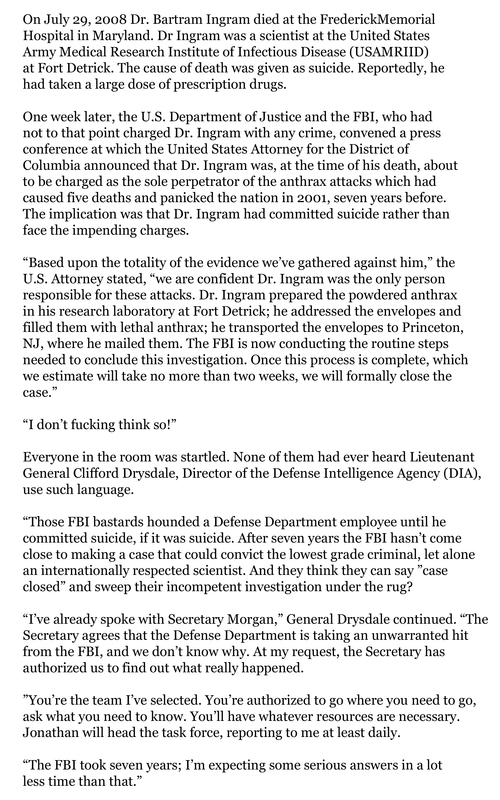 Does the FBI actually know who prepared and mailed the lethal anthrax (not Ivins) but for some reason is withholding the truth from the American people? 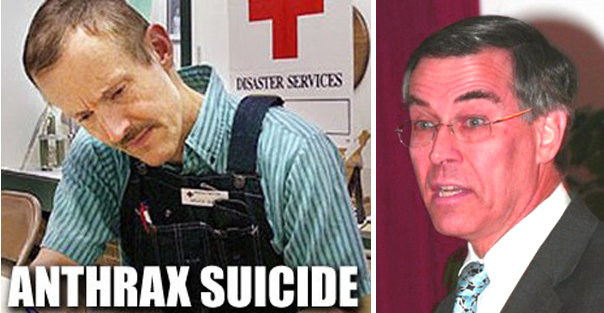 There is growing pressure (from Congressman Rush Holt and now others) to re-open the investigation. It will be very hard to do so. The FBI is nobody’s patsie, and if they don’t want to say something, it will be very hard to force them to do so. But exactly that path is the way we must go. We must all support Congressman Holt and the few others who have begun to speak out. We must get to the truth. 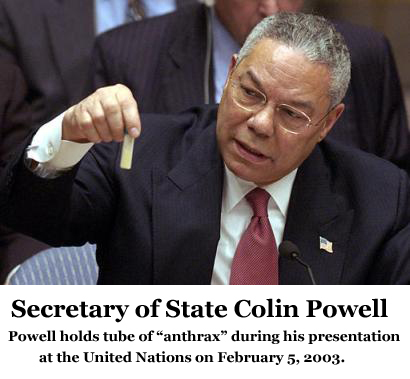 in an interview with The Guardian, Former U.S. Secretary of State Colin Powell has called on the CIA and Pentagon to explain why they failed to notify him of unreliability of a key source who claimed knowledge of Saddam Hussein’s bio-weapons capability. Colin Powell had every reason to doubt the information pandered by the Bush/Cheney crowd, and he was certainly positioned to find out for himself. The best spin on the matter is that Powell did not have the courage and the independence to investigate. The worst spin is that he knew the truth – no WMD, no anthrax – and supported the call for war anyway. This is the most disgraceful episode of Powell’s otherwise mostly distinguished career and he compounds the problem now by blaming others for his own shortcomings and moral inadequacies. to support their “war of choice” in Iraq. was a major part of making that case. The Justice Department and the FBI identified Maryland scientist Bruce E. Ivins as having single-handedly carried out the attacks that killed five people and seriously sickened 17 others. The department was on the verge of seeking an indictment in 2008 when Mr. Ivins took his own life. Doubts lingered about Mr. Ivins’s guilt. Now, a report by the National Academy of Sciences (NAS) raises new questions about whether Mr. Ivins was wrongly accused. The lengthy report cites several instances in which the Justice Department appears to have overstated the strength of the scientific evidence against Mr. Ivins. The report insinuates throughout that FBI failure to perform more tests or to be more precise could have erroneously eliminated other suspects or prematurely settled on Mr. Ivins as a suspect. Congress should convene a nonpartisan commission staffed with individuals experienced in law enforcement to probe all of the evidence in the case, including that which the FBI claims shows Mr. Ivins had the opportunity and the wherewithal to carry out the 2001 attack. The inquiry should explore why and how the Justice Department eliminated other scientists who had access to RMR-1029 as suspects, and it should examine the security protocols at repositories for biological weapons. The exploration also should focus on the country’s preparedness to deal with such an attack in the future. Amazingly, we may just learn the truth that the FBI has been withholding all these years. As I have repeatedly stated on this blog, the FBI’s publicly presented case against Dr. Ivins is clearly bogus: no evidence, no witnesses, an impossible timeline, science that proves innocence instead of guilt. So what really happened? And why doesn’t the FBI offer America a credible story? * Is the Flight 93 Hijacker discussed in the NAS report the same fellow who had the leg lesion Homeland Security biosecurity head Tara O’Toole thought consistent with anthrax?